, a French writer who once made a great figure in the literary world, was born Nov. 18, 1647, at Carla, a small town in the county of Foix, the son of John Bayle, a Protestant minister. Peter gave early proofs of genius, which his father cultivated with the utmost care; he himself taught him the Latin and Greek languages, and sent him to the Protestant academy at Puylaurens in 1666. The same year, when upon a visit to his father, he applied so closely to his studies, that it brought upon him an illness which kept him at Carla above eighteen, months. On his recovery he returned to Puylaurens to prosecute his studies, and afterwards he went to Toulouse | in 1669, where he attended the lectures in the Jesuits’ college. The controversial books which he read at Puylaurens raised several scruples in his mind in regard to the Protestant religion, and his doubts were increased by some disputes he had with a priest, who lodged in the same house with him at Toulouse. He thought the Protestant tenets were false, because he could not answer all the arguments raised against them; so that about a month after his arrival at Toulouse, he embraced the Roman catholic religion. This gave much uneasiness to all his relations, and Mr. Bertier, bishop of Rieux, rightly judging, that after this step young Bayle had no reason to expect any assistance from them, took upon him the charge of his maintenance. They piqued themselves much, at Toulouse, upon the acquisition of so promising a young man. When it came to his turn to defend theses publicly, the most distinguished persons of the clergy, parliament, and city, were present; so that there had hardly ever been seen in the university a more splendid and numerous audience. The theses were dedicated to the Virgin, and adorned with her picture, which was ornamented with several emblematical figures, representing the conversion of the respondent. Some time after Mr. Bayle’s conversion, Mr. Naudis de Bruguiere, a young gentleman of great wit and penetration, and a relation of his, happened to come to Toulouse, where he lodged in the same house with him. They disputed warmly about religion, and after having pushed the arguments on both sides with great vigour, they used to examine them over again coolly. 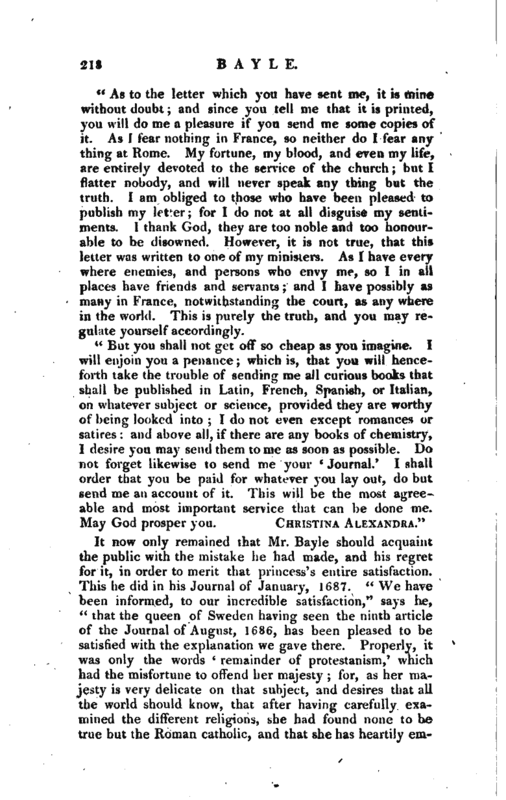 These familiar disputes often puzzled Mr. Bayle, and made him distrust several opinions of the church of Rome; and he began to suspect that he had embraced them too precipitately. 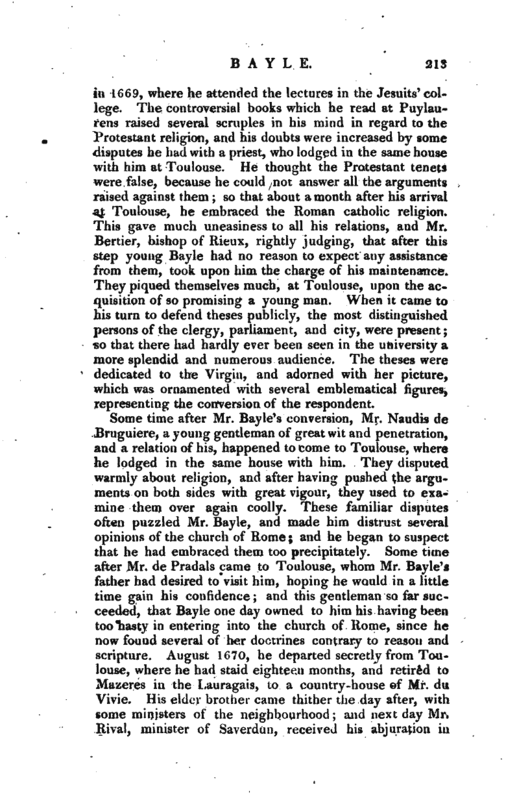 Some time after Mr. de Pradals came to Toulouse, whom Mr. Bayle’s father had desired to visit him, hoping he would in a little time gain his confidence; and this gentleman so far succeeded, that Bayle one day owned to him his having been too hasty in entering into the church of Rome, since he now found several of her doctrines contrary to reason and scripture. August 1670, he departed secretly from Toulouse, where he had staid eighteen months, and retired to Mazeres in the Lauragais, to a country-house of Mr. du Vivie. His elder brother came thither the day after, with some ministers of the neighbourhood; and next day Mr. Rival, minister of Saverdun, received his abjuration in | presence of his elder brother and two other ministers, after which they obliged him instantly to set out for Geneva. Soon after his arrival here, Mr. de Normandie, a syndic of the republic, having heard of his great character and abilities, employed him as tutor to his sons. 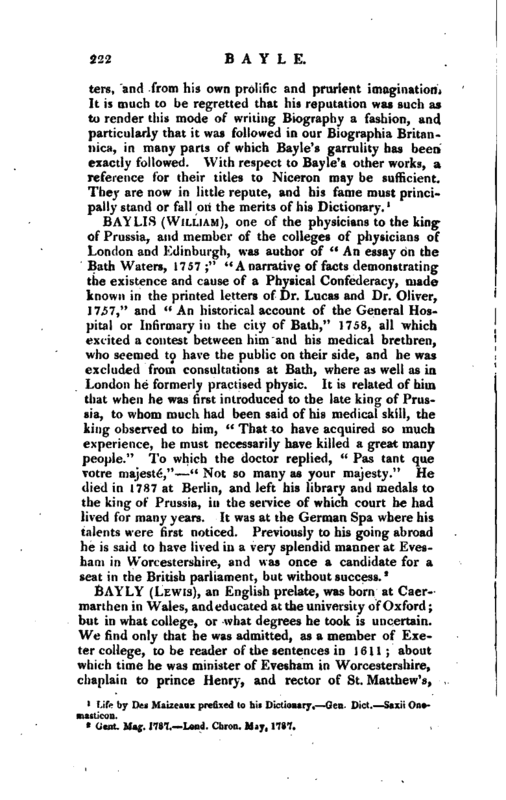 Mr. Basnage at that time lodged with this gentleman, and it was here Mr. Bayle commenced his acquaintance with him. When he had been about two years at Geneva, at Mr. Basnage’s recommendation he entered into the family of the count de Dhona, lord of Copet, as tutor to his children; but not liking the solitary life he led in this family, he left it, and went to Roan in Normandy, where he was employed as tutor to a merchant’s son; but he soon grew tired of this place also. His great ambition was to be at Paris; he went accordingly thither in March 1675, and, at the recommendation of the marquis de Ruvigny, was chosen tutor to messieurs de Beringhen, brothers to M. de Beringhen, counsellor in the parliament of Paris. 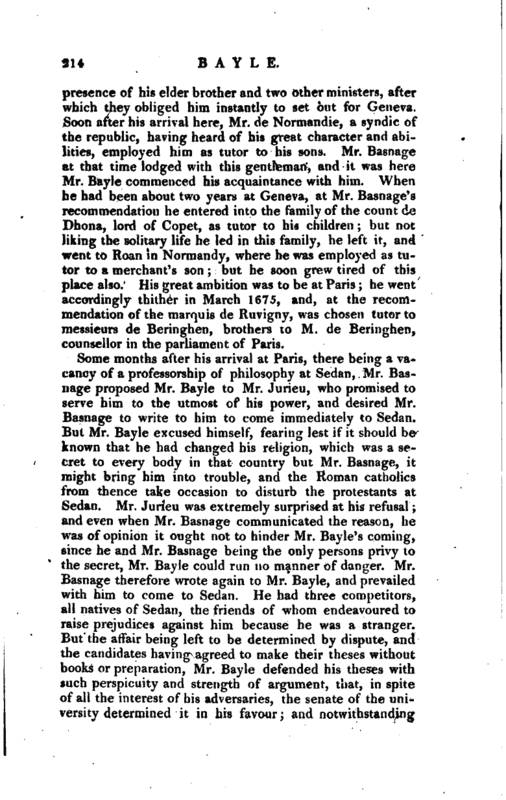 Some months after his arrival at Paris, there being a vacancy of a professorship of philosophy at Sedan, Mr. Basuage proposed Mr. Bayle to Mr. Jurieu, who promised to serve him to the utmost of his power, and desired Mr. Basnage to write to him to come immediately to Sedan. But Mr. Bayle excused himself, fearing lest if it should be known that he had changed his religion, which was a secret to every body in that country but Mr. Basnage, it might bring him into trouble, and the Roman catholics from thence take occasion to disturb the protestants at Sedan. Mr. Jurieu was extremely surprised at his refusal; and even when Mr. Basnage communicated the reason, he was of opinion it ought not to hinder Mr. Bayle’s coming, since he and Mr. Basnage being the only persons privy to the secret, Mr. Bayle could run no manner of danger. Mr. Basnage therefore wrote again to Mr. Bayle, and prevailed with him to come to Sedan. He had three competitors, all natives of Sedan, the friends of whom endeavoured to raise prejudices against him because he was a stranger. But the affair being left to be determined by dispute, and the candidates having agreed to make their theses without books or preparation, Mr. Bayle defended his theses with such perspicuity and strength of argument, that, in spite of all the interest of his adversaries, the senate of the university determined it in his favour; and notwithstanding | the opposition he met with upon his first coming to Sedan, his merit soon procured him universal esteem. Jn 1680, an affair of the duke of Luxemburgh made a great noise; he had been accused of impieties, sorcery, and poisonings, but was acquitted, and the process against him suppressed. 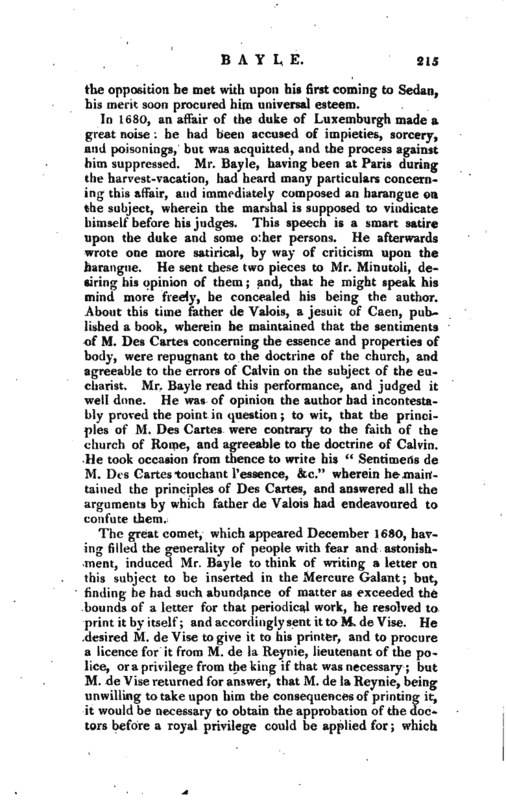 Mr. Bayle, having been at Paris during the harvest-vacation, had heard many particulars concerning this alfair, and immediately composed an harangue on the subject, wherein the marshal is supposed to vindicate himself before his judges. This speech is a smart satire upon the duke and some o’her persons. He afterwards wrote one more satirical, by way of criticism upon the harangue. He sent these two pieces to Mr. Minutoli, desiring his opinion of them; and, that he might speak his mind more freely, he concealed his being the author. About this time father de Valois, a Jesuit of Caen, published a book, wherein he maintained that the sentiments of M. Des Cartes concerning the essence and properties of body, were repugnant to the doctrine of the church, and agreeable to the errors of Calvin on the subject of the eucharist. Mr. Bayle read this performance, and judged it well done. He was of opinion the author had incontestably proved the point in question; to wit, that the principles of M. Des Cartes were contrary to the faith of the church of Rome, and agreeable to the doctrine of Calvin. He took occasion from thence to write his “Sentimens de M. Dcs Cartes touchant Tessence, &c.” wherein he maintained the principles of Des Cartes, and answered all the arguments by which father de Valois had endeavoured to confute them. The great comet, which appeared December 1680, having filled the generality of people with fear and astonishment, induced Mr. Bayle to think of writing a letter on this subject to be inserted in the Mercure Galant; but, finding he had such abundance of matter as exceeded the bounds of a letter for that periodical work, he resolved to print it by itself; and accordingly sent it to M. de Vise. 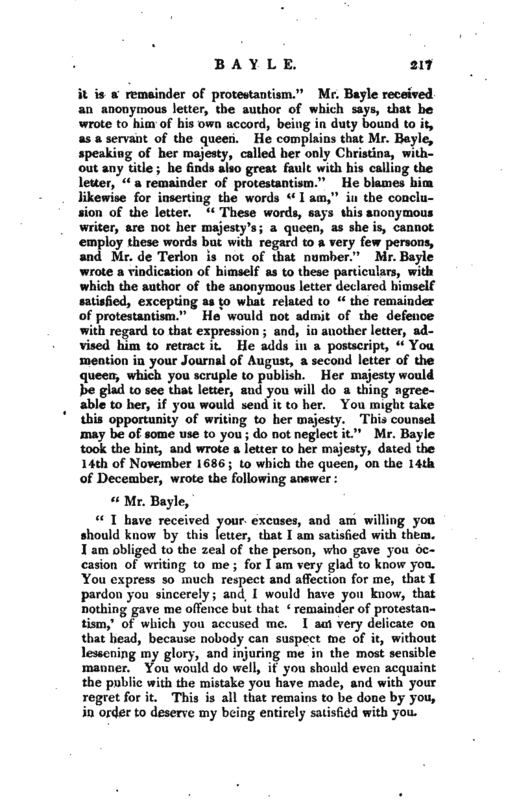 He desired M. de Vise to give it to his printer, and to procure a licence for it from M. de la Reynie, lieutenant of the police, or a privilege from the king if that was necessary; but M. de Vise returned for answer, that M. de la Reynie, being unwilling to take upon him the consequences of printing it, it would be necessary to obtain the approbation of the doctors before a royal privilege could be applied for; which | being a tedious and difficult affair, Mr. Bayle gave over all thoughts of having it printed at Paris. The protestants in France were at this time in a distressed situation; not a year passed without some infringement of the edict of Nantz, and it was at length resolved to shut up their academies. That at Sedan was accordingly suppressed by an arret of Lewis XIV. dated the 9th of July, 1681. Mr. Bayle staid six or seven weeks at Sedan after the suppression of the academy, expecting letters of invitation from Holland; but not receiving any during that time, he left Sedan the 2d of September, and arrived at Paris the 7th of the same month, not being determined whether he should go to Rotterdam or England, or continue in France; but whilst he was in this uncertainty he received an invitation to Rotterdam, for which place he accordingly set out, and arrived there the 30th of October, 1681. He was appointed professor of philosophy and history; with a salary of five hundred guilders per annum. 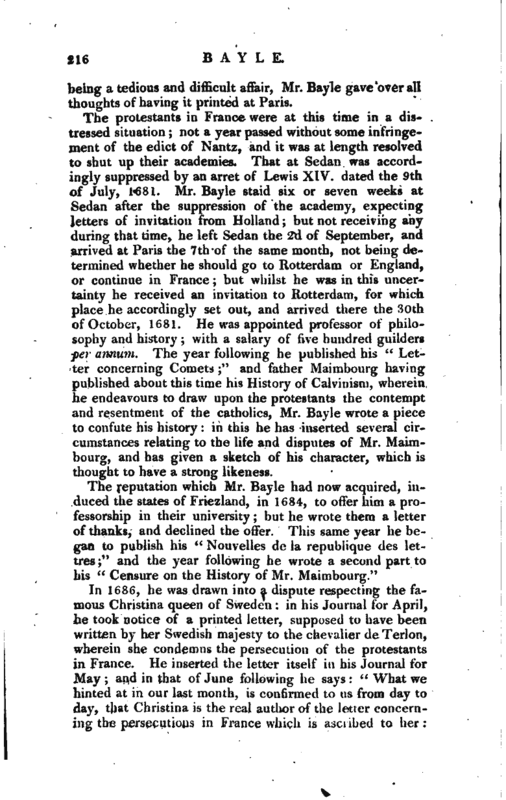 The year following he published his “Letter concerning Comets;” and father Maimbourg having published about this time his History of Calvinism, wherein he endeavours to draw upon the protestants the contempt and resentment of the catholics, Mr. Bayie wrote a piece to confute his history: in this he has inserted several circumstances relating to the life and disputes of Mr. Maimbourg, and has given a sketch of his character, which is thought to have a strong likeness. “I have received your excuses, and am willing you should know by this letter, that I am satisfied with them. I am obliged to the zeal of the person, who gave you occasion of writing to me; for I am very glad to know you. You express so much respect and affection for me, that I pardon you sincerely; and I would have you know, that nothing gave me offence but that ‘ remainder of protestantism, 7 of which you accused me. I am very delicate on that head, because nobody can suspect me of it, without lessening my glory, and injuring me in the most sensible manner. You would do well, if you should even acquaint the public with the mistake you have made, and with your regret for it. This is all that remains to be done by you, in order to deserve my being entirely satisfied with you. | ”As to the letter which you have sent me, it is mine without doubt and since you tell me that it is printed, you will do me a pleasure if you send me some copies of Jt. As I fear nothing in France, so neither do I fear any thing at Rome. My fortune, my blood, and even my life, are entirely devoted to the service of the church; but I flatter nobody, and will never speak any thing but the truth. I am obliged to those who have been pleased to publish my letter; for I do not at all disguise my sentiments. I thank God, they are too noble and too honourable to be disowned. However, it is not true, that this letter was written to one of my ministers. As I have every where enemies, and persons who envy me, so I in all places have friends and servants; and I have possibly as many in France, notwithstanding the court, as any where in the world. This is purely the truth, and you may regulate yourself accordingly. The persecution which the protestants at this time suffered in France affected Mr. Bayle extremely. He made occasionally some reflections on their sufferings in his Journal; and he wrote a pamphlet also on the subject. 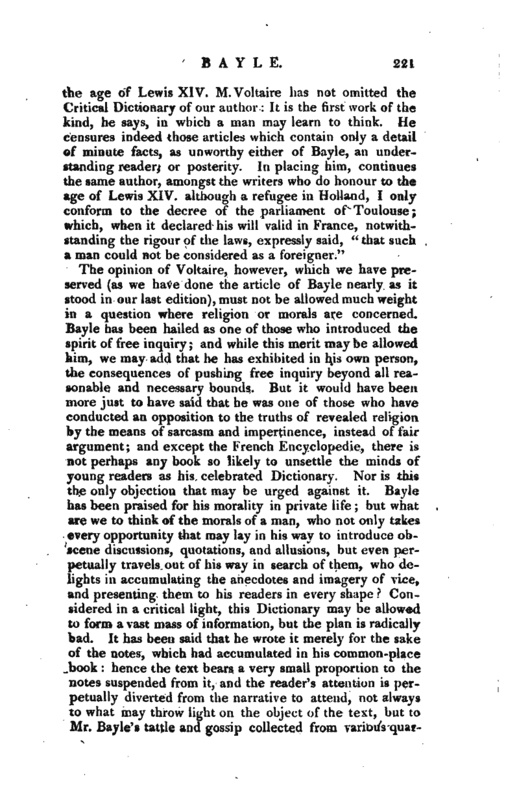 Some time after he published his “Commentaire philosophique,” upon these words, “Compel them to come in;” against compulsion in matters of religion; but the great application he gave to this and his other works, threw him into a fit of sickness, which obliged him to discontinue his Literary Journal. Being advised to try a change of air, he left Rotterdam, and went to Cleves;, whence, after having continued some time, he removed to Aix la Chapelle, and thenct? returned to Rotterdam. In 1690, the famous book, entitled, “Avis aux Refugiez,” &c. made its appearance: Mr. Jurieu, who took Mr. Bayle for the author, wrote a piece against it, and prefixed an advice to the public, wherein he calls Mr. Bayle a profane person, and a traitor engaged in a conspiracy against the state. As soon as Mr. Bayle had read this accusation, he went to the grand schout of Rotterdam, and offered to go to prison, provided his accuser would accompany him, and undergo the punishment he deserved, if the accusation was found unjust. He published also an answer to Mr. Jurieu’s charge; and as his reputation, and even his life was at stake, in case the accusation of treason was proved, he therefore thought himself not obliged to keep any terms with his accuser, and attacked him with the utmost severity. Mr. Jurieu applied to the magistrates of Amsterdam, who advised him to a reconciliation with Mr. Bayle, and enjoined them not to publish any thing against each other | till it was examined by Mr. Boyer, the pensioner of Rotterdam.But, notwithstanding this prohibition, Mr. Jurieu attacked Mr. Bayle again, and drew from him to write a new vindication of his character and principles. 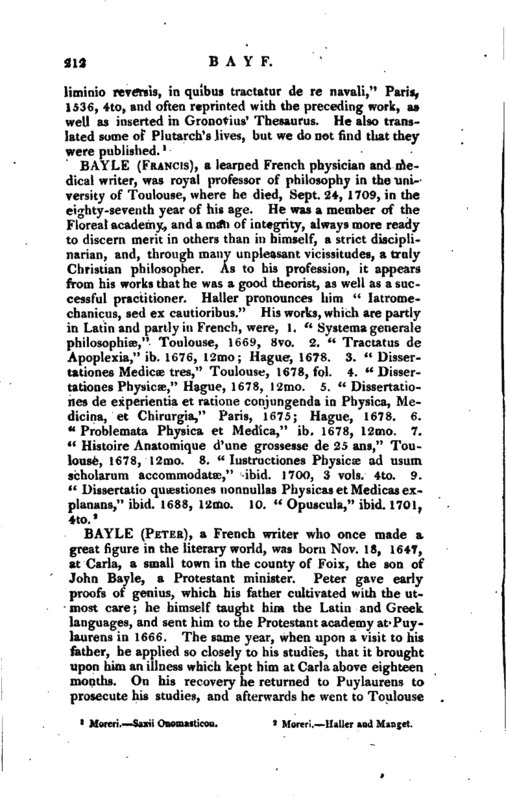 In November, 1690, Mr. de Beauval advertised in his Journal, a scheme for a “Critical Dictionary.” This was the work of Mr. Bayle. The articles of the three first letters of the alphabet were already prepared; but a dispute happening betwixt him and Mr. de Beauval, he for some time laid the work aside. Nor did he resume it till May 1692, when he published his scheme; but the public not approving of his plan, he threw it into a different form, and the first volume was published in August, 1695, the second the October following. The work was extremely well received by the public; but it engaged him in fresh disputes, particularly with Mr. Jurieu and the abbe Renaudot. Mr. Jurieu published a piece, wherein he endeavoured to engage the ecclesiastical assemblies to condemn the Dictionary: he presented it to the senate sitting at Delft; but they took no notice of the affair. 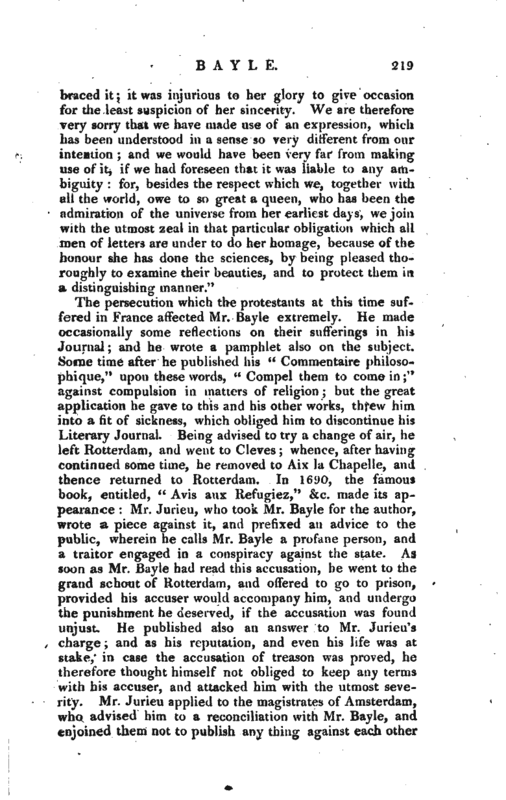 The consitory of Rotterdam granted Mr. Bayle a hearing; and after having heard his answers to their remarks on his Dictionary, declared themselves satisfied, and advised him to communicate this to the public. Mr. Jurieu made another attempt with the consistory in 1698; and so far he prevailed, that they exhorted Mr. Bayle to be more cautious about his principles in the second edition of his Dictionary; which was published in 1702, with many additions and improvements. 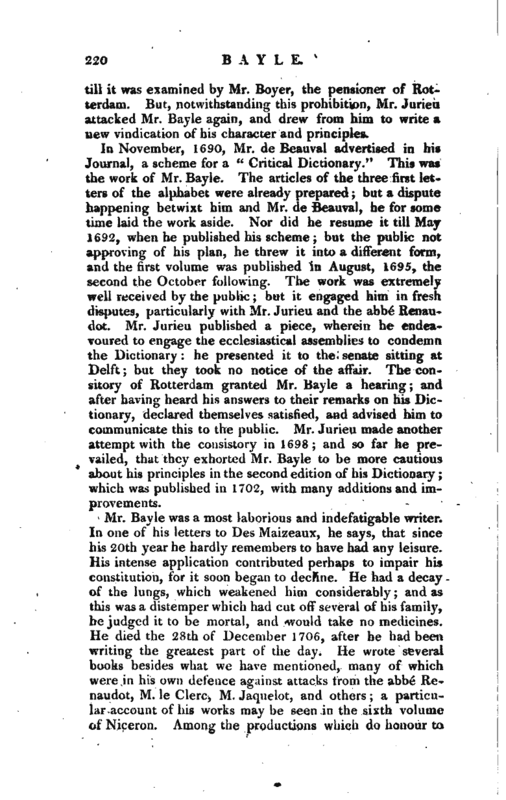 Life by Des Maizeaux prefixed to his Dictionary. Gen. Did. —Saxii Onomasticon.